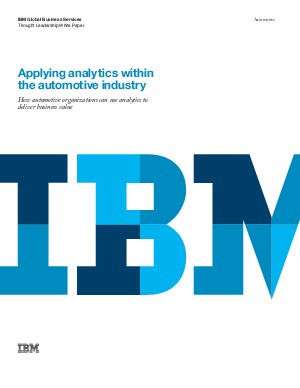 This paper has been developed by IBM to offer our perspective on how automotive organizations can use analytics to deliver business value. Using our knowledge of the automotive industry, we have taken input from our global client engagements, and research undertaken by the IBM Institute for Business Value and leading analysts such as Gartner, to identify how companies within the automotive industry are using analytics. The goal of this paper is to stimulate thinking on a broad range of potential applications of analytics in the automotive industry, and to support our clients in unlocking value held within their data. The paper describes the potential applications of analytics from a business rather than a technology perspective. The boundary between analytics and reporting (or business intelligence) is not always distinct. The blurring of this boundary is increasingly true as static reports gain increasing levels of user interaction and as single reports are brought together into dashboard. In this paper, we focus on more advanced analytics.